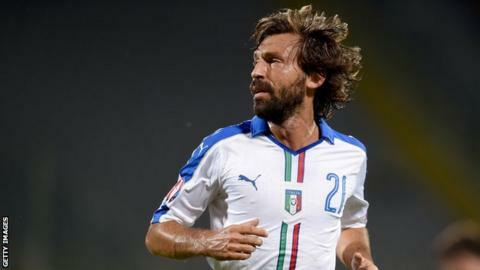 Andrea Pirlo will not be joining Inter Milan on loan from New York City, says Nerazzurri boss Roberto Mancini. The 36-year-old Italy midfielder had been linked with a move to Inter, as well as Mancini's old club Manchester City. The former AC Milan player and Juventus captain played for Inter earlier in his career. "Pirlo? I don't even have his phone number. It's you lot that have been on about him for weeks," said Mancini. "He's a fantastic player who has won everything in Europe and now he's decided to try a new experience in another league." Pirlo has made 13 Major League Soccer appearances for New York City after joining them mid-season from Juve, but they failed to reach the play-offs. Inter went back to the top of the Serie A table on Sunday with a 4-0 victory over Frosinone. Mancini added: "We're delighted to be top and if the lads can keep this up we'll be able to challenge for the Scudetto, but our real target is getting back in the Champions League. "We'll have to wait and see. There are three or four sides better equipped than we are to win the title because they've been playing together for longer."